Now Playing in Chicago! 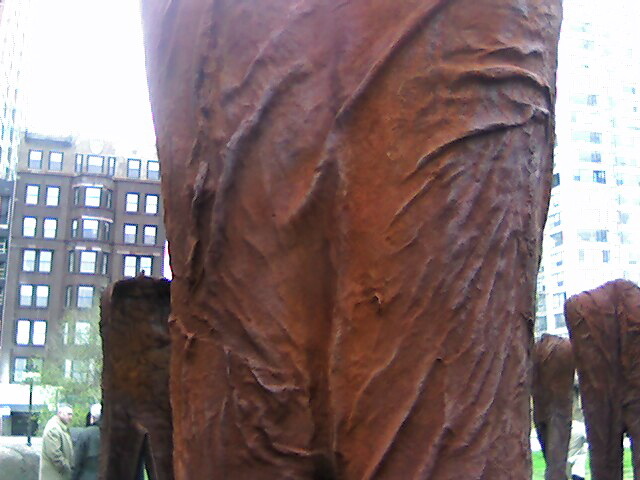 “Agora.” By Magdalena Abakanowicz. A cold day. A day of Warsaw weather. Windy and blustery. She arrived early. And she would pose gracefully, for all who wanted to photograph her. I asked her about the concrete plinth. If she liked the way it turned out. “Yes,” she said, “we worked very hard to make sure it was not ‘popular grey. '” I asked if she’d rather have them walk on the earth. 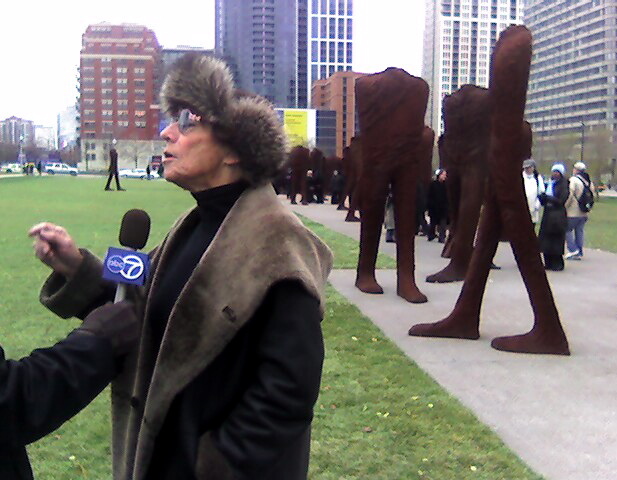 “It’s not necessary,” said Abakanowicz. 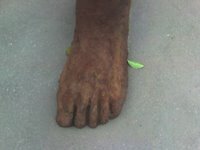 I later learned she had worked hard to get the concrete that color. 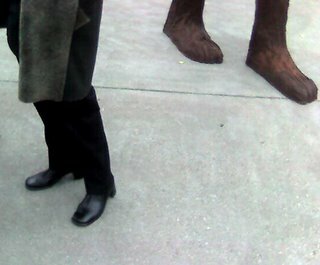 She had had the workers put booties on each of the figures, then spray the concrete with color. Then she didn’t like that, so she had them take it off. Then she had them put the booties back on, and had it sprayed again. Then it was brushed by hand to get it a certain color. I asked her why she gave this four to ten million dollar sculpture as a gift to the people of Chicago. She said, “For the people I am friendly with, money is not power. Generosity is power. 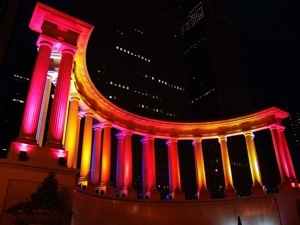 Friendship is power.” And she said, “This is not the first time I am in Chicago. I was here in 1982. There was a big show of my work. 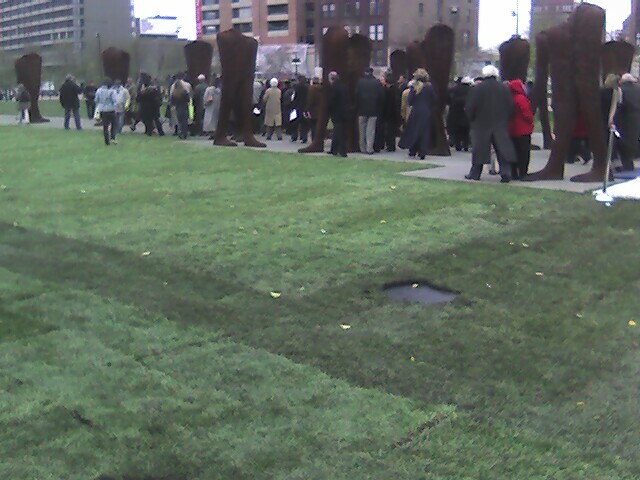 On all the streets it said, “Abakanowicz. 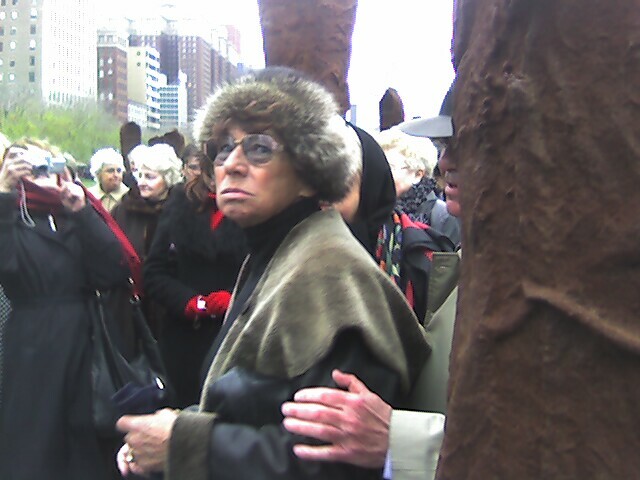 Abakanowicz.” She never forgot that her first comprehensive retrospective in America was here. Poland was still under communism then. And she was a mid-career artist. 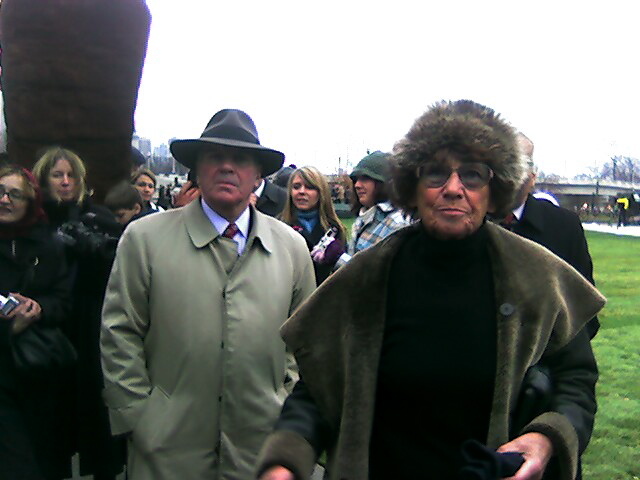 Mayor Daley showed up to help dedicate this new work. That’s him in the fedora on the right. Abakanowicz started to speak to the crowd but after just a couple of minutes she choked up and couldn’t continue. 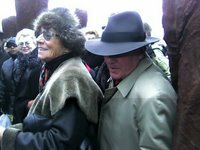 The crowd swelled behind Mayor Daley, trying just to get close to him. It must be his power, right? When he veered left, we all behind him veered left. When he leaned right, we all leaned right. When he paused, people jostled to get close to his raw power. 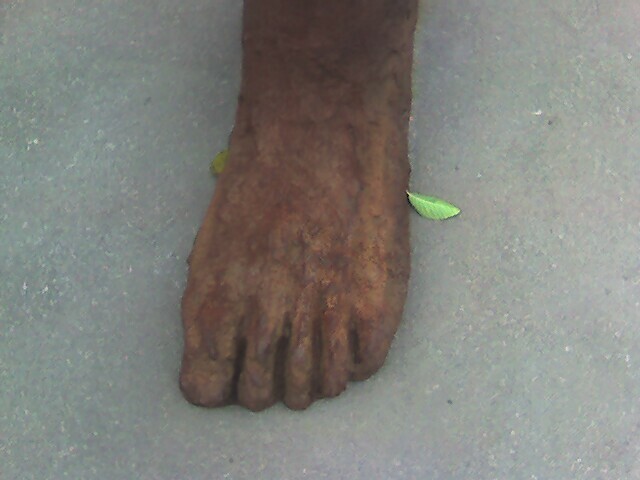 Is that what her sculpture portrays? 106 figures in search of a leader? And to what end will they follow that fellow? A detail reminded me of communist times in Poland. I’d been there when authorities were visiting a down-and-out village. Somehow it would all get painted and spruced up before their arrival. Here, I’d watched city crews in the morning frantically sod this just-completed construction zone so it would look good for the Mayor. So what do I think of ‘Agora?’ It’s impressive. It creates an impression. You can not walk through it and not feel something. 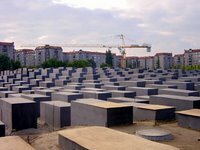 As you can at another work that grew in some way out of the horrors of World War Two, Eisenman’s ‘Memorial to the Murdered Jews of Europe’ in Berlin. There you feel nothing. Not because it’s abstract. But because the stones have a coating on them, and are mainly a design. On a grid. Abakanowicz’ group faces all different directions and that creates an energy, a movement, a group mentality, relationships, life for the work. You feel a lot. 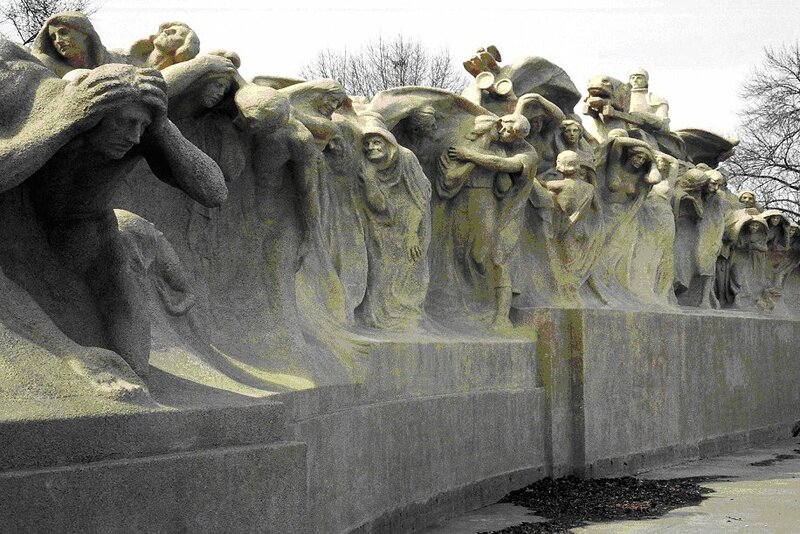 You feel the march of time, as you do at Loredo Taft’s ‘Fountain of Time’ in Hyde Park. That they’re headless and armless makes you feel the passage of time also. 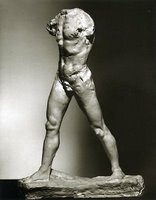 They are ruins in a way, the way we see many sculptures from antiquity today. You feel the weight of history. It’s just a short step from the Roman precedent to what she’s doing. 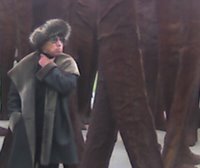 And I love the red in these works, cast in Poznan, Poland. That the backs are empty, scooped out, makes them lighter. And we join our own bodies to theirs. I love that the groupings open up and get more dense as you walk through them. As life does, and history does, and cities do. I love that these will look nice from the windows in the residential skyscrapers around them. (Send me a photo please!) 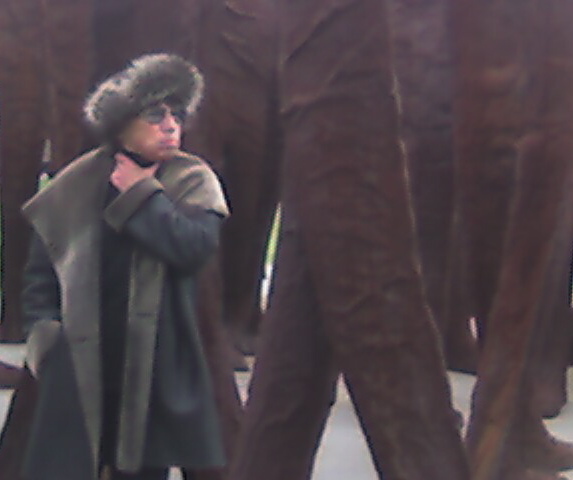 Abakanowicz said the neighbors had been inviting her up to look at the aerial view and all are thrilled. They will need to be lit at night, and well-lit. The south loop behind these is a new neighborhood, and I say no place is a neighborhood until it has a great piece of public art. This will be landscaped next year, with prairie grasses not too far away. Benches are coming too. Wooden I hope. I love, believe it or not, that you’ll see them from your car as you zoom down Michigan Avenue, and it’s big enough and compelling enough to make you stop and get out to experience them. I like them. I think there’s nothing nobler than a tree, and 106 beautiful, colorful living, growing let’s say, white birch trees would also look nice here. But trees are plentiful in the park; and these cast iron monsters make you think. They probably make you appreciate the peace of nature more; and they’ll make you happier to see ‘Cloud Gate‘ (‘the joy bean’) in Millennium Park. Mayor Daley’s right, they bookend the park. 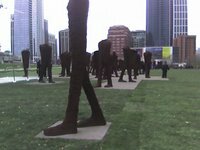 Many other sculptors want to be in Grant Park, there was a moratorium after Millennium Park, these were supposed to go in Museum campus, but Daley said he wanted people to see them, and he wanted that bookend and he broke the moratorium. I’m glad he did. But here are the questions: why are there 106 headless, armless torsos? Why is today’s sculpture so overdone, monumental and repetitive? Doesn’t that make it easier to cause an impression, but an impression of scale rather than content? Does Abakanowicz do anything more with 106 than Rodin did with just one headless, armless walking torso? Yes, she does. It’s a more complete experience, at least for a person of our time – the era of reproduction and multiple images at once. And I like the movement it shows. 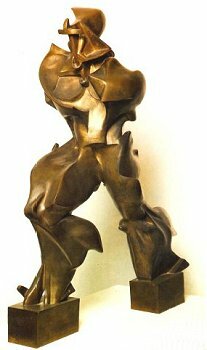 No fair, I love the Boccioni! I’d love to see a large one, outdoors, animating a well-designed piazza. But here we were, in nature, except for the concrete plinths that I still don’t care for. We’re in a town that’s very eastern European, Polish in topography and population. No wonder the Mayor was inspired in his speech, and Nelson Algren’s poem to the city may have worked its way into his mind. It’s urban, it’s raw, it’s a lot of people not really together, it’s masses in search of a leader, people looking for their heads, and for which way to go. It’s Chicago. The Tribune says it could be controversial. 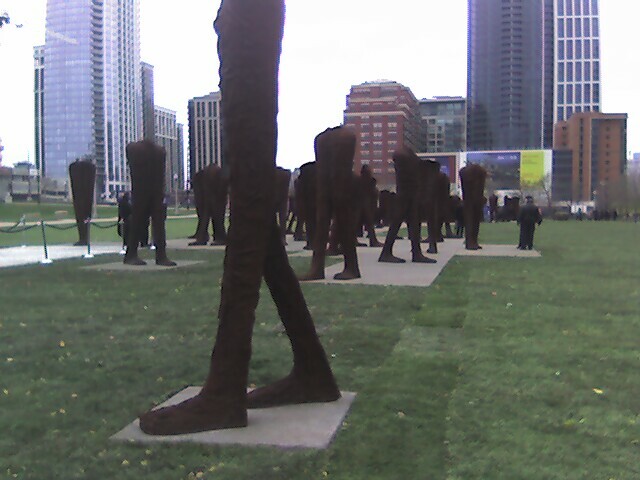 and the Sun-Times critic wonders what the headless giants are thinking? ‘only-connect’ has some must-see photos of Agora, you even see the red I was talking about. The artist and her sculpture. 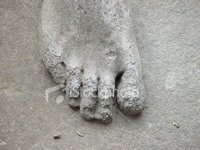 *** I write a lot more on Agora here! Soon as it snows I’ll go there and write even mora on Agora. You are currently browsing the archives for the Berlin Mahnmal category.